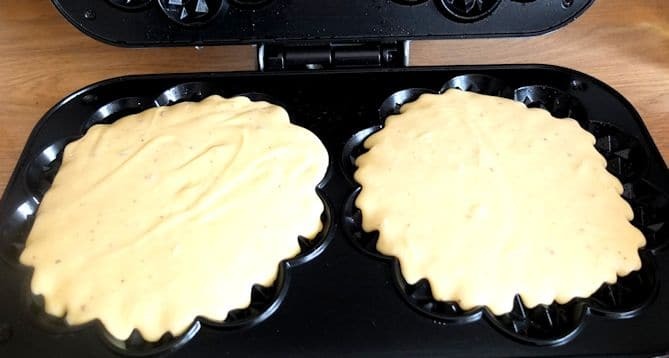 Oh the delights of a wafflemaker… Only once I decided I was going to publish a waffle recipe series on this blog, did I start thinking about all the alternative recipes that you can make with a wafflemaker. Unil now I always stuck to my mum’s original waffle recipe and and missed out on taste sensations such as these Crunchy Anis Waffle Biscuits. 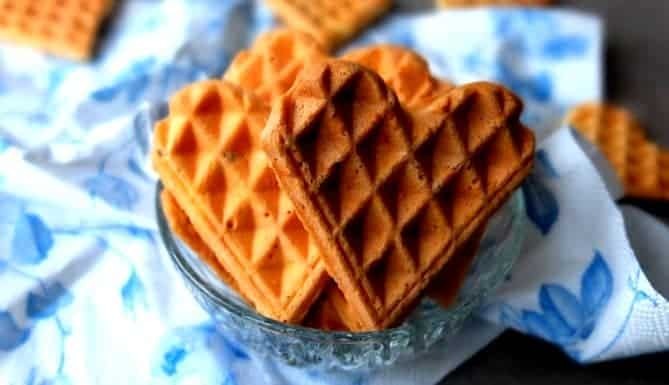 These waffles biscuits have a very different texture from the traditional waffles that you usually make in this wafflemaker, because they are crunchy. The secret is that they are made with palm fat not butter. 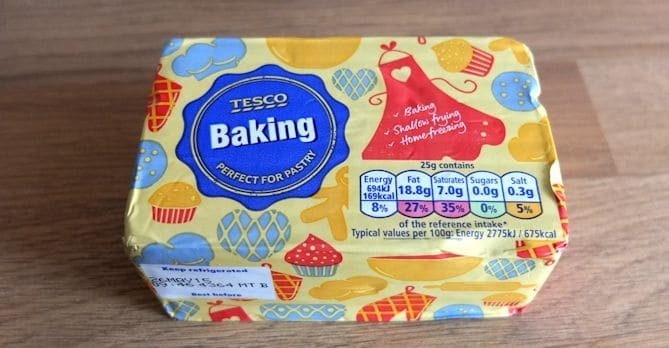 Now, I know that this is not a usual ingredient in England, but I found a great substitute for it in Tesco: Tesco Baking Fat . Also, I found it difficult to find star anis seeds, so had to buy to whole star anis, and then cracked them open with a pestle in mortar to retrieve the seeds. It’s really quick and easy and sounds more work than it actually was. This is my Valentine’s recipe for this year. But these Valentine’s biscuits are not for my husband, who gets spoilt with too much food anyway, but for his Grandad Aubrey. Aubrey loves to eat and has been a little poorly of lately. And I thought it would cheer him up. Melt the palm fat in a pot. Place it into a bowl and leave it to cool down at room temperature. Now place the star anis seeds into a frying pan without any fat, and roast them until they are light yellow. Leave them to cool and then crumble them to a fine powder with a pestle and mortar. Mix the flour, corn flour, baking powder and anis seeds. With an electric hand mixer mix in the sugar, vanilla flavouring, 1 pinch of salt and palm fat. Add the eggs one by one. Now add the flour mixture and mix to a smooth though. Heat up your waffle maker and brush it with a little oil. Scoop our about ⅕ of the dough and bake them golden brown. Let them cool on a plate. Now produce more waffles with the rest of the though. 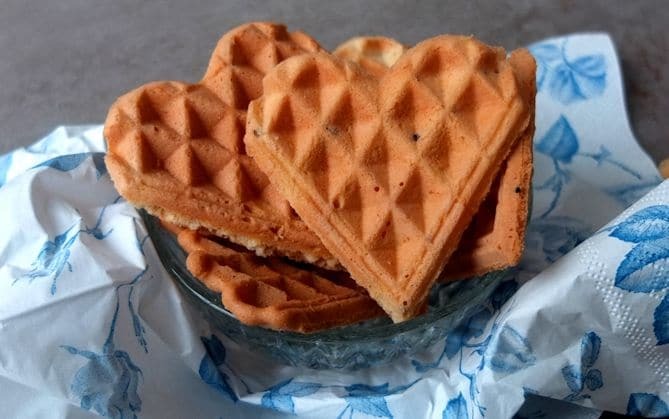 Break the waffles into heart shaped pieces, and keep them in a biscuit tin until you are ready to eat them. Tripp: You can keep these biscuits in a biscuit tin up to 2 weeks. One Response to "Crunchy Anis Waffle Biscuits"